Mendel, Chaye, Sarah Miriam, Hinda, Chyiam Hersh, Joel, Margulis. Aaron Teitelbaum (born 20 October 1947) is one of the two Grand Rebbes of Satmar, and the chief rabbi of the Satmar community in Kiryas Joel, New York. Aaron Teitelbaum is the oldest son of the late Grand Rabbi of Satmar Moshe Teitelbaum, who was the nephew of the late Satmar Rebbe, Grand Rabbi Joel Teitelbaum. Aaron Teitelbaum married Sasha, the daughter of Grand Rabbi Moshe Yehoshua Hager, the previous Vizhnitzer Rebbe of Bnei Brak, Israel. In 1985, Aaron Teitelbaum was appointed as the chief rabbi and rosh yeshiva of the Satmar congregation in Kiryas Joel, which gave him authority over all the community's affairs. some of the residents of Kiryas Joel at that time resented the appointment of Aaron, having issues with his personality and controlling nature. In May 1999, Moshe Teitelbaum appointed his eldest son, Zalman Teitelbaum, as the local leader of the Williamsburg congregation. This was seen as a signal from Moshe that Zalman was to become Chief Rabbi after his death. Prior to May 1999, it was assumed that after the death of Moshe Teitelbaum, Satmar would be led by Aaron Teitelbaum, the eldest son. He was his father's representative in communal affairs and assumed his father's responsibilities when his father traveled. Moshe's appointment of Zalman as the local leader caused factions to form around Aaron and Zalman. Aaron supporters claimed that Moshe was "swayed by his advisers" to appoint Zalman because the advisers were concerned they would lose influence under Aaron's regime. In April 2006, when Moshe died, each side declared their rabbi as the chief rabbi. At that time, Aaron supporters already controlled all assets in Kiryas Joel. Aaron supporters initiated legal proceedings to take control of the Williamsburg holdings from the Zalmen supporters, including control of the sacred cemetery of the Brooklyn congregation. The court declined to render a decision, leaving the status quo. The non-decision was seen as a victory for the Zalman faction. In May 2012, Teitelbaum forbade his followers from possessing computers in their homes unless the computers are strictly necessary for a business and they have a content-control software program. He also ruled that his female followers may not possess smartphones under any circumstances. In keeping with the traditional beliefs of Satmar, Teitelbaum is firmly opposed to Zionism. Teitelbaum is affiliated with the Jerusalem based anti Zionist Edah HaChareidis, particularly with the organization's vice president, Moishe Sternbuch. In April 2013, Teitelbaum denounced the proposed draft of Haredi men by the Israel Defense Forces as "a decree worse than the annihilation of the Jewish people." "During the funerals, the parents eulogized their sons, but I think it would have been preferable if they had done tshuva [repented], if they had said viduy [confession] with tears, in the nusach [style] that is used on Yom Kippur, to repent for their decision to live and learn Torah in a place of barbaric murderers." The speech was broadcast on Kol Satmar, the Satmar news service. Teitelbaum was criticized for making such remarks about parents while they were mourning their children. Rabbi Menachem Mendel, previously use to serve as a Chief Rabbi of the Satmar community and also as a Rosh Yeshiva in Antwerp, Belgium. In 2006, When according to his father's order he returned to the United States and was appointed to serve as a Chief Rabbi of his father's followers in Williamsburg. In 1984, in a wedding which took place in Nassau Coliseum with the participation of tens of thousands people, he married his first cousin Rebbetzin Brucha Sima, daughter of Rabbi Bearish Meisles, the Chief Rabbi of Satmar community in Borough Park and son in law of the deceased Grand Rabbi Moshe Teitelbaum of Satmar. This wedding was considered to have been one of the greatest events in the Ultra orthodox Jewish world. Rebbetzin Chaya, married to Rabbi Chanoch Henich, son of Grand Rabbi Yitzchok Ashkenazi of Alesk. Rebbetzin Sarah Miriam, married to her relative Rabbi Boruch, son of Grand Rabbi Nochum Efrain Teitelbaum of Volova. Rebbetzin Hinda, Married Rabbi Shimon Ze'ev, son Rabbi Zalman Leib Meisles, Chief Rabbi of the local community in Sea Gate. Rabbi Chaim Tzvi, serves as a Rabbi of the Sighet synagogue in Williamsburg. married to Rebbetzin Rivkah Sarah Chaya, Granddaughter of Rabbi Moshe Halberstam, the previous Grand Rabbi of the Kiviashd community in Brooklyn.Named for his great-grandfather. Rebbetzin Channa, married Rabbi Duvid Dov, son of Grand Rabbi Yosef Tzvi Dushinsky (The second) the current Rebbe of the Dushinsky dynasty in Jerusalem. Rabbi Yoel, married Rivkah Blima, daughter of Rabbi Leibish Eichenstein from Monsey. Rebbetzin Margulis, married Rabbi Yosef, son of Rabbi Yoel Rokeach from Monsey. ^ a b c d e f g h Wakin, Daniel J. (22 January 2002). "The Heir Unapparent; Brothers' Feud Fractures a Hasidic Community". The New York Times. Retrieved 7 July 2014. ^ a b c d e Mintz, Jerome (2009). Hasidic People: A Place in the New World. Harvard University Press. pp. 209–210. ISBN 0674041097. ^ a b c d e McKenna, Chris (21 November 2007). 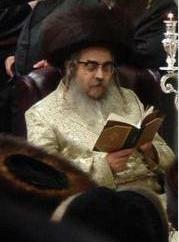 "Brooklyn faction wins in latest Satmar ruling". Times Herald-Record. Retrieved 7 July 2014. ^ a b Ginsberg, Alex (1 November 2007). "COURT AVOIDS RABBIS' WAR". New York Post. Retrieved 7 July 2014. ^ a b Kahn, Gabe (31 May 2012). "Satmar Rebbe – It's Me or Your Smartphones!". Arutz Sheva. Retrieved 7 July 2014. ^ Nachshoni, Kobi (12 April 2013). "Satmar: IDF draft worse than annihilation". Ynet. Retrieved 7 July 2014. ^ a b Sokol, Sam (7 July 2014). "Rival Satmar faction blasts rebbe". The Jerusalem Post. Retrieved 7 July 2014. ^ Ghert-Zand, Renee (4 July 2014). "Satmar head blames parents for murders". The Times of Israel. Retrieved 7 July 2014.